Dr. Benjamin VanCleve Hunt (1773-1849), a physician, lived in Mt. Pleasant for only four years, from 1845 to his death in 1849. One of his sons, Benjamin A. Hunt (1816-1903) born New Jersey, resided in Mt. Pleasant (Mt. Healthy) until his death. The younger Hunt was on the board of directors of Farmers’ College for several terms beginning in 1864 and into the 1870s. Oral tradition has it that his house was a station on the Underground Railroad. The house that stands at 1575 St. Clair Avenue may be the original house built by the Hunts but its exact date of construction is unknown. The Mt. 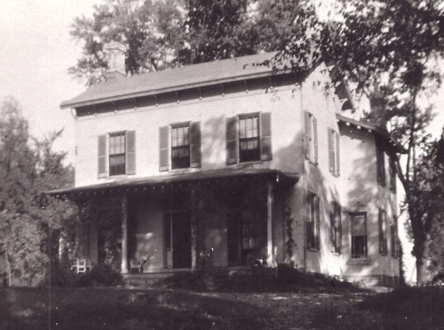 Healthy Historical Society’s files contain numerous mentions of this house: newspaper articles from the 1930s and 1940s and later, oral history interviews, and compiled histories of the city mention the Benjamin Hunt house as a station on the Underground Railroad. We have no source documentation to corroborate this.